To get back on schedule, and also to help me during packing and moving, the Publishing News post will be next Friday, not this one. 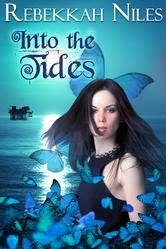 The protagonist of Into the Tides, Kelly, is a tone-deaf woman who inherited music magic (called a music Power). Because of her tone deafness, when her Power emerged at puberty, she couldn't use it; after a few years of trying to help her themselves, her family sent her to a special boarding school that helps youngsters who have problems with their magic. Kelly, age 17, starts her first year at Mechany's. At the end of the first week, the students without mentors are interviewed by tutor-researchers (most of whom are grad students), who in exchange for the opportunity to study abnormal magic development will offer one-on-one additional tutoring to students. During Kelly's session, twenty-seven researchers looking for "projects" interview the thirty-eight new students. "I have a learning disability in magic. I'm a little... dysfunctional." The woman in the lab coat nodded encouragingly, looking more comfortable in the narrow classroom desks than I felt. This was her natural environment, after all: observing students. Then again, she couldn't be more than twenty. She was probably a student herself half the time. "My notes show you have a music Power," she commented. I nodded. "Fourth class, if I'm like my dad. I want to do what he does, one day--go to clinics and sing away pain from the patients." She scratched a note on her paper. "Admirable. It's a good use for music magic. So what sort of problems do you notice with your magic?" Beside us, a twelve-year-old appeared a foot above the ground, upside down, and plummeted to the floor, feet barely missing my head. I jumped up with a little shriek. "Sorry," he said, and sat up and waved at a guy in a lab coat on the other side of the room. "Every time I sneeze," he called. "Although only sometimes upside down." I sat down, watching him jog back to the researcher. He definitely had a tutor--the researcher watched every step avidly, the eager light in his eyes full of acquisitive joy. My partner's lips pursed. "Probably got the kid to do that on purpose," she muttered to me. "He's such a show off. And travel Powers always get the most attention in terms of a thesis. But who's it gonna help?" I folded my hands in my lap. "My dad had a rock band for a while," I said. "He's really good. If he wasn't Powered, he'd probably have become a star. We've been trying for years, but even he can't get my magic to work right." Her attention came back to me. "So it's a resilient problem." A girl about fifteen or so jumped up, whapping at her desk with a heavy-looking yellow-and-black blanket. She'd carried it in with her despite the 80-degree weather, and at the time I'd thought the black patches were some strange dyework. The room was otherwise quiet while she put out of the flames with a few well-placed blows, everyone watching. Finally, the man in a lab coat who'd prudently backed a few feet away walked over to stare at the smudges. "These desks are supposed to be pretty much fireproof," he commented with an even tone. "I think you warped it." She sighed, flopping down into the seat and rubbing at the smudge with a corner of the blanket. "Sorry." He smiled and clapped her shoulder. "Not at all." I cleared my throat, and my partner reluctantly tore her eyes from the scene to look back at me. The bite of plastic pinching my fingers told me I was fiddling with the fish bracelet around my wrist, so I stopped. "Once, when I was fourteen, I tried to hum my brother's headache away, only I ended up making him fall asleep instead, and he didn't wake up for almost twelve hours." Her polite smile drooped a little. "Um. Anything else?" "Well, when Mom was editing a book, I tried singing her a song to help her focus. After about three minutes she said she really had to pee, and she couldn't concentrate for most of the night." "That's, uh, interesting." Her gaze slid down to her clipboard. "What, exactly, do you know about your problem?" I was fidgeting with my bracelet again. "I'm tone deaf." "Yeah." Lacing my hands together so I'd keep them still, I stared at her, hoping. She didn't look back up at me. "A tone-deaf music Power. And you've had no unusual, special abilities manifest? Just ordinary things?" I shook my head. "Usually I can't get my magic to work at all. But nothing a normal music Power couldn't do." "Well, it's sort of an obvious problem. Easy to identify. And fourth class is... I mean, it's nice. Not the strongest level of magic, though." The plastic fish on my bracelet seemed to swim around in my vision, and not by any magic or trick of the light. I squeezed my eyes and willed them to stay dry. A woman on the side of the room shouted in surprise, and a young girl apologized. "The school is really very good at addressing cases like yours," my partner said. "I just don't think you'd need me. You understand, right?" The sound of heels on linoleum told me she was standing up. "I really think you'll be fine," she added. "They're professionals, the regular teachers. Really good at what they do. And it's such an obvious problem, I'm sure there's an obvious solution. They'll have you good to go in a year, I bet. Maybe two." Her heels clicked away, and I heard her mutter something about a blind illusion Power and smells. None of the other researchers stopped by my desk. Not that year. Not the next. And not the year after that, either, even though I still hadn't managed to make my magic work. My magic was broken, but not broken enough.